Adrian "Addie" Joss (April 12, 1880 – April 14, 1911), nicknamed "The Human Hairpin," was an American pitcher in Major League Baseball (MLB). He pitched for the Cleveland Bronchos, later known as the Naps, between 1902 and 1910. Joss, who was 6 feet 3 inches (1.91 m) and weighed 185 pounds (84 kg), pitched the fourth perfect game in baseball history. His 1.89 career earned run average (ERA) is the second-lowest in MLB history. Connie Mack also sent a scout to watch Joss and later offered the young pitcher a job playing on his Albany club in the Western League, which Joss declined. :p.22 In 1899, Joss played for a team in Oshkosh, earning $10 per week ($283 in today's dollars). After player salaries were frozen by team owners, Joss joined the junior team in Manitowoc, which had been split into two teams, as a second baseman and was soon promoted to the senior squad, where he was developed into a pitcher. He was seen by a scout for the Toledo Mud Hens and in 1900 accepted a position with the team for $75 per month ($2,126). :p.22 While in Ohio he was considered "the best amateur pitcher in the state." He started the Mud Hens' season opener on April 28 and earned the win in the team's 16–8 victory. He won 19 games for the club in 1900. After the season ended, Joss returned to Wisconsin where he led Racine to the 1901 Wisconsin baseball state championship against Rube Waddell's Kenosha squad. He also enrolled at Beloit College and played American football. :p.47 It was reported that Joss had signed with the Brooklyn Dodgers of the National League as early as August 18 and received a $400 advance ($11,339), but Joss denied receiving any money. :p.47 Mud Hens owner Charles Stroebel stated that he had signed Joss and other Mud Hens players for the 1902 season on August 12 and that the Western League was under the protection of the National League through September 1901. Before 1901 ended, the Cleveland Bronchos offered $500 ($14,174) to Toledo in exchange for Joss and manager Bob Gilks, who would be a scout for Cleveland. Toledo and Joss agreed and Joss was now a member of the American League, which was paying a premium on baseball talent to rival the National League. :p.22 Dodgers owner Charles Ebbets invited Joss for a meeting, which Joss declined, and Joss let it be known that he had told Stroebel he would play for the Mud Hens for the 1902 season and received a $150 ($4,089) advance in February 1902. On October 11, 1902, Joss married Lillian Shinivar in shortstop Nap Lajoie. In Joss' second year, he went 18–13 and lowered his ERA from the season before to 2.19. His walks plus hits per inning pitched (WHIP) was a MLB-low 0.948. For the 1904 season, the 24-year-old Joss went 14–10 with a 1.59 ERA and did not give up a home run on the season. Illness during the season reduced his starts. He had his first of four 20-win seasons in 1905 as he ended the season with a 20–12 record and 2.01 ERA. He finished with a career-high 132 strikeouts. In 1906 his 1.72 ERA was third in the league and he finished with a 21–9 record and tied a career-high with nine shutouts. 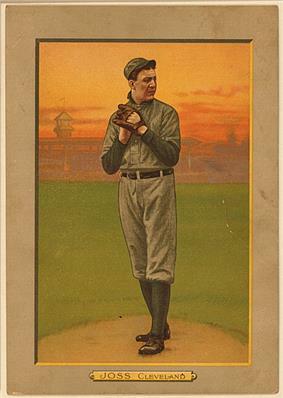 To begin the 1907 season, Joss won his first 10 starts. He threw two one-hitters on the season, the first on September 4 against the Detroit Tigers and the second on September 25 versus the New York Highlanders. When teammate Heinie Berger threw his own one-hitter on September 26, it marked just the second time since 1900 that two pitchers from the same team had thrown back-to-back one-hitters. Joss finished the season with career-bests in wins (finished 27–11) and 338 2⁄3 innings pitched. His win total tied with Doc White for highest in the American League and his WHIP was second-best (behind Cy Young) while both his complete game (34) and shutout (6) totals were third-best in the league. Joss's repertoire included a  In an era filled with spitball pitchers, Joss achieved his success without ever altering the baseball. Joss threw with a corkscrew windup motion, described as "an exaggerated pinwheel motion." Shortstop Roger Peckinpaugh described his windup: "He would turn his back toward the batter as he wound up, hiding the ball all the while, and then whip around and fire it in." ^ a b "Fame Beckons Joss, MacPhail". ^ "Addie Joss". Wisconsin Historical Society. Retrieved November 5, 2012. ^ "Birth Record Details". Wisconsin Historical Society. Retrieved July 23, 2009. ^ a b c d e f g h Porter, David L. (2000). Biographical Dictionary of American Sports: G–P. Westport, CT: Greenwood Press. p. 775. ^ a b c d e f g h i j k l m n Coffey, Michael (2004). 27 Men Out: Baseball's Perfect Games. New York, NY: Atria Books. ^ a b c d e f g h i "Addie Joss Statistics and History". ^ a b c Schneider, Russell (2004). The Cleveland Indians Encyclopedia. Champaign, IL: Sports Publishing. ^ a b c d e f g h i j k l m n Semchuck, Alex. "Addie Joss". ^ a b c d e Buckley, Jr., James (2012). Perfect: The Inside Story of Baseball's Twenty Perfect Games. Chicago, IL: Triumph Books. ^ a b c d e f Pajot, Dennis (2011). Baseball's Heartland War, 1902–1903: The Western League and American Association Vie for Turf, Players and Profits. Jefferson, NC: McFarland & Company. ^ La Russa, Tony; Purdy, Dennis (2006). The Team-by-Team Encyclopedia of Major League Baseball. New York, NY: Workman Publishing. p. 350. ^ "1907 American League Pitching Leaders". ^ a b c d Lewis, Franklin A. (2006). The Cleveland Indians. Kent, OH: The Kent State University Press. ^ Goldman, Steven (September 8, 2006). "You Could Look It Up: No Hits For You". ^ "Perfect Games by Pitchers". Baseballalmanac.com. Retrieved November 5, 2012. ^ Wilbert, Warren N. (2003). What Makes an Elite Pitcher? : Young, Mathewson, Johnson, Alexander, Grove, Spahn, Seaver, Clemens and Maddux. McFarland & Company. p. 88. ^ "Single-Season Leaders & Records for Walks & Hits per IP". ^ "1908 American League Season Summary". ^ "1909 American League Pitching Leaders". ^ McEntire, Madison (2006). Big League Trivia: Facts, Figures, Oddities, and Coincidences from our National Pastime. Bloomington, IN: AuthorHouse. p. 86. ^ "1909 American League Season Summary". ^ Baldassaro, Lawrence; Johnson, Richard A., eds. (2002). The American Game: Baseball and Ethnicity. Carbondale, IL: Southern Illinois University Press. p. 32. ^ "Cleveland Indians Team History & Encyclopedia". ^ "Career Leaders & Records for Earned Run Average". ^ "Career Leaders & Records for Walks & Hits per IP". ^ a b c d e Kneib, Martha (2005). Meningitis. New York, NY: The Rosen Publishing Group. ^ Poremba, David Lee (2000). The American League: The Early Years. Chicago, IL: Arcadia Publishing. p. 41. ^ Neyer, Rob; James, Bill (2004). The Neyer/James Guide to Pitchers: An Historical Compendium on Pitching, Pitchers and Pitches. New York, NY: Fireside. pp. 28–29. ^ a b Gutman, Bill (2008). "Shine On, Superstar". What If the Babe Had Kept His Red Sox? : And Other Fascinating Alternate Histories From the World of Sports. New York, NY: Skyhorse Publishing. ^ Honig, Donald (1977). The Man in the Dugout. Chicago: Follett Publishing Company. ^ Husman, John R. (2003). Baseball in Toledo. Charleston, SC: Arcadia Publishing. p. 107. ^ Frommer, Harvey (1992). Shoeless Joe and Ragtime Baseball. Lincoln, NE: University of Nebraska Press. p. 26. ^ a b c d Fleitz, David L. (2001). Shoeless: The Life and Times of Joe Jackson. Jefferson, NC: McFarland & Company. ^ a b c Freedman, Lew (2010). The Day the Stars Came Out: Major League Baseball's First All-Star Game, 1933. Jefferson, NC: McFarland & Company. ^ a b Whatever Happened to the Hall of Fame? : Baseball, Cooperstown, and the Politics of Glory. New York, NY: Fireside. 1995. p. 334. ^ Berkow, Ira (1986). Red: A Biography of Red Smith. Lincoln, NE: University of Nebraska Press. p. 195. ^ "Hall of Fame changes rules". ^ Tierney, John P. (2004). Jack Coombs: A Life in Baseball. Jefferson, NC: McFarland & Company. p. 187. ^ "Indians resurrect hall of fame". ^ "Baseball Hall of Fame Inducts 3". ^ "Feller Sets New Mark With Eighth One-Hitter of Career". Joss was inducted into the Cleveland Indians Hall of Fame on July 29, 2006. He was inducted in the same class as Ray Chapman, Rocky Colavito, Al Lopez, Sam McDowell, Al Rosen and Herb Score. In 1981, Lawrence Ritter and Donald Honig included him in their book The 100 Greatest Baseball Players of All Time. They described what they called "the Smoky Joe Wood Syndrome," where a player of truly exceptional talent has a career curtailed by injury or illness. They argued that such a player should still be included among the greatest all-time players, in spite of career statistics that would not quantitatively rank him with the all-time greats. They believed that Joss' career ERA was proof enough of his greatness to be included. Baseball author John Tierney wrote: "Joss is remembered for a remarkably low career ERA, but it should be noted that he pitched in a time before earned runs were compiled as an official statistic, and his career ended in 1910, before the American League introduced its new baseball in 1911, leading to a nearly 25 percent increase in runs scored."